32-year HP veteran Vyomesh Joshi is out at the company amid a shakeup that will combine PCs and printers into one unit. NEW YORK (CNNMoney) -- Hewlett-Packard is shaking up its business yet again, combining its printer and personal computer divisions. One of HP's longest-tenured and most-admired executives is retiring as a result. HP's printing group was once its shining star, returning ridiculously high profit margins on ink cartridge sales. But that business stagnated over the past decade and particularly slumped in the last few years. HP's printing profit fell 10% last year as sales remained flat. The holiday season was particularly tough. Ink sales fell 6%, office printers fell 5% and consumer printer sales tumbled 15% in the company's fiscal first quarter, which ended in January. As it lumps printers and PCs together, HP (HPQ, Fortune 500) said that imaging and printing group chief Vyomesh "VJ" Joshi was stepping down. 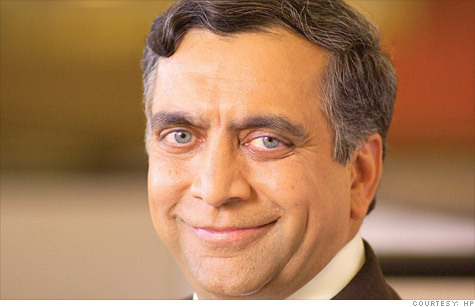 Joshi, the division's leader for the past decade, served in various roles at HP throughout his 32-year career there. His tenure dates back to the golden years of "Bill and Dave," when Bill Hewlett and Dave Packard still had active roles at the company they founded. "VJ embodies the spirit of HP and his impact on the company has been tremendous," HP CEO Meg Whitman said in a written statement. "We wish him the very best as he embarks on a new chapter in his life." After Ann Livermore stepped down as HP's enterprise chief last year, Joshi was the last remaining top HP executive to have ties to the Bill and Dave era. He is well-respected throughout the industry and had long been considered a superstar executive. Joshi was forced off of Yahoo (YHOO, Fortune 500)'s board in that company's shakeup last month. He had been a Yahoo director for seven years. The merging of the printing and PC units means HP Personal Systems Group executive Todd Bradley will now oversee two struggling businesses. HP considered spinning off its PC unit last year. The board later decided that it would hang onto the business-critical but low-margin unit. The overall PC industry is stuck in neutral, but HP, the world's largest computer maker, is traveling at high speed in reverse. PC sales fell 3% last year and 15% during the holiday quarter, with consumer computer sales tumbling 25%. Whitman said on recent conference calls with investors that she hopes to streamline HP's businesses and ensure that individual business groups work together in the future. She also said that the company's divisions have been too separate in the past, leading to too much competition within the ranks.